Middletown, RI - Blanche A. (Wronowski) Sefton, 96, of Middletown, died Tuesday, March 18, 2014 at Newport Hospital Newport, RI. She was the wife of the late John Sefton. Born in New London, CT on June 26, 1917, the youngest of six children, she was the daughter of the late John and Eva (Kozicky) Wronowski. Mrs. Sefton worked for many years for the Middletown High School as a Chief Clerk. 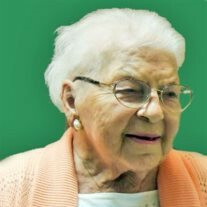 She attended Business School in New London, CT. Mrs. Sefton was a member and treasurer of Friends of Middletown Public Library, a treasurer of AARP Newport Chapter and treasurer of Middletown Horticultural society. She is survived by her children, Blanche Sefton Lutz and her husband Ronald Lutz of Santa Fe, NM, Margaret Bellucci and her life-partner John Stancin of Fernandina Beach, FL, Joyce E. Devine and her husband Eric Kingman of Hope Valley, RI and Susan Hunter and her husband Arlin Greene of Lake Luzerne, NY, her grandchildren, Robin Lutz Beattie, Mary Devine, John Lutz and Matt Bellucci and great grandchild Reynaldo Lutz-Cruz. Calling hours will be held on Friday, March 21, 2014, from 4:30-6:30 in the Memorial Funeral Home, 375 Broadway, Newport, followed by a celebration of life service at 6:30. In lieu of flowers, donations in her memory may be made to Friends of Middletown Public Library, 700 West Main Road, Middletown, RI 02842 or Forest Farm, Patient Activities Fund, 191 Forest Avenue, Middletown, RI 02842. Memorial Funeral Home, Connors Funeral Home and Hambly Funeral Home proudly serve Newport RI and the greater Newport County communities: Middletown, Portsmouth, Tiverton, Jamestown, Bristol, Warren, and Little Compton, RI.